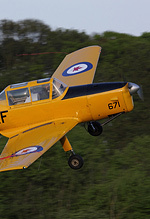 Mid-May sees the first of the evening displays at Old Warden for 2010. 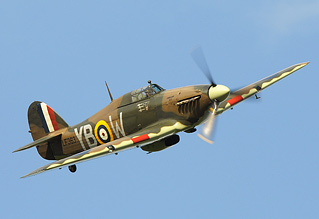 The purpose of these events is to savour the garden party atmosphere at Shuttleworth whilst capturing the unique collection of vintage aircraft and vehicles in the early evening light. After the big freeze of the earlier Spring Air Display, the weather gods looked favourably at Old Warden this time and perfect conditions resulted on the Saturday evening which meant a full flying display was possible. 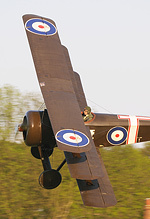 Ian Matthews and Steve Buckby report from Old Warden in Bedfordshire. All photos by the authors. The Spitfire IIa and Hurricane IIc of the Battle of Britain Memorial Flight took time out from their busy Duxford weekend display schedule to perform a series of flypasts to open the flying at 18:30. 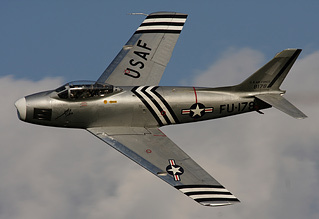 Also making a welcome return was another Duxford resident, the Golden Apple operated F-86A Sabre. The smoking General Electric J-47 engine sounded fantastic as she flew the famous 'bend' of the Old Warden display line. The sizable crowd were treated to a topside feast from the resident flying aces. Highlights included the return of the Hawker Hind to the air plus chief-pilot Trevor Roche putting the Sopwith Triplane thorough an impressive series of low level manoeuvres. Sadly it was the last Shuttleworth show for the Bucker Bestmann as she heads off to a new owner. Pilot Peter Holloway giving her a good send-off with the Bestmann leading a formation with the Miles Magister pair. A limp windsock indicated it was time to unleash the Edwardians into the fading light. For the average flyer these machines would be difficult to tame but the Old Warden masters manage to fly them in formation. Amazing! Although the 18:30 display start was welcomed by the photographers for their sunset shots, the late finish meant that the airshow audience had to make their way home in the dark. Maybe a 17:30 start would be more welcome for future evening displays? So with the day almost done, it was time to head home for tea & medals and end another cracking evening display at Old Warden.